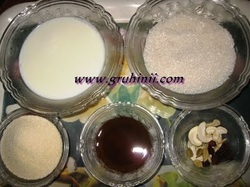 Mix all the Ingredients (except cashews, raisins and cardamom powder) in a non stick pan or a thick bottomed vessel. Cook in a medium flame for 8 to 10. Keep stirring. When the halwa starts thickening simmer the flame. Cook for 6 to 8 mins. until the halwa is done. (remember your should stir continuously) Add cardamom powder. 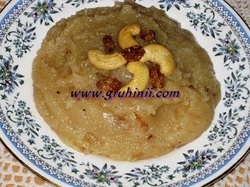 Sooji Doodh halwa/Rava milk halva is ready. Take it into a serving bowl and garnish with roasted cashews and raisins. Tastes good when served either hot or cold.